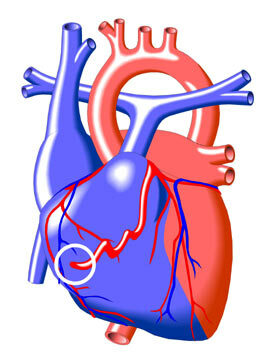 The coronary arteries are the blood vessels that carry oxygen-rich blood to the heart muscle. In this defect, one of these arteries (usually the left coronary artery) is abnormally formed. Rather than connecting with a coronary vein, as in the normal heart, it enters one of the heart chambers, usually on the right side. (Note the point of entry on the diagram below left, indicated by a circle.) In rare cases, the abnormal coronary artery may enter the aorta or pulmonary artery, or one of their branches, rather than a heart chamber. A fistula is an abnormal connection between two hollow organs in the body - in this case, a coronary artery and a chamber of the heart, or another vessel.